Americans have long regarded owning a home to be largely synonymous with the so-called "American dream." High homeownership rates are not necessarily synonymous with a high-income prosperous society. Switzerland and Germany, for example, have homeownership rates well below that usually found in the US. Nevertheless, the US government has long made increasing homeownership an important policy goal, and this has led to a number of large and costly programs and institutions including Fannie Mae and Freddie Mac, FHA, and a plethora of federal regulations surrounding mortgage lending and banking. Things haven't quite gone as planned. The most recent quarterly data from the Us Census Bureau shows that the homeownership rate in the United States has fallen to a 51-year low. as of the second quarter of 2016. The homeownership rate has been declining since 2004 when it peaked at 69.2 percent. The rate has gone into virtual free-fall over the past two years, however, as home prices have continued to rise and incomes have not kept up. In Colorado, the trend has been somewhat similar in recent years, although the homeownership rate here is only at a 21-year low. The Census Bureau only publishes annual data on Colorado-specific homeownership rates, but using annual data, we find that 2015's homeownership rate is the lowest recorded since 1994. 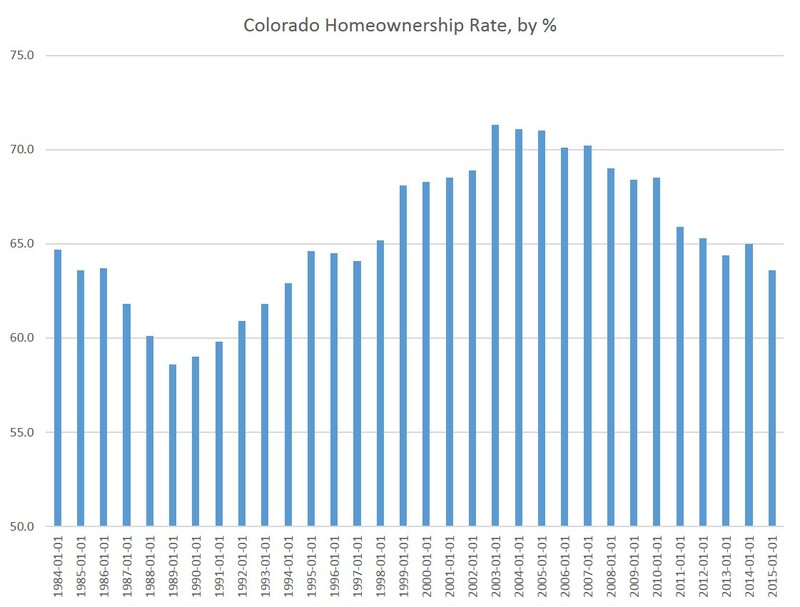 Colorado's economy was in a recession for much of the 1980s, so we find that the homeownership rate hit a multi-year low in 1989 (58.6 percent) and gradually increased until hitting in 2003 what was likely the highest level ever achieved since white men started building houses in Colorado. Since 2003, though, when the rate was 71.3 percent, the rate has fallen nearly nonstop. This is likely due to several factors, although the big ones are likely rising housing costs and stagnant household incomes. In this post, I looked at household incomes in Colorado and found that incomes have remained largely flat over the past decade. Meanwhile, as most everyone on the Front Range knows, housing prices have moved upward, with the Case-Shiller home price index increasing around 10 percent, year over year, in most months in recent years. In other words, household incomes do not appear to be keeping up with home prices, and it stands to reason that is pushing down the homeownership rate. That's not the only reason that homeownership is declining, of course. There could be other factors such as demographic shifts, including more young people choosing to marry later and have children later, which can lead to less demand for a for-purchase home. Affordability does look to be a real issue, however, and if potential buyers must turn to renting a home (although that is an expensive alternative) this pushes down the homeownership rate. 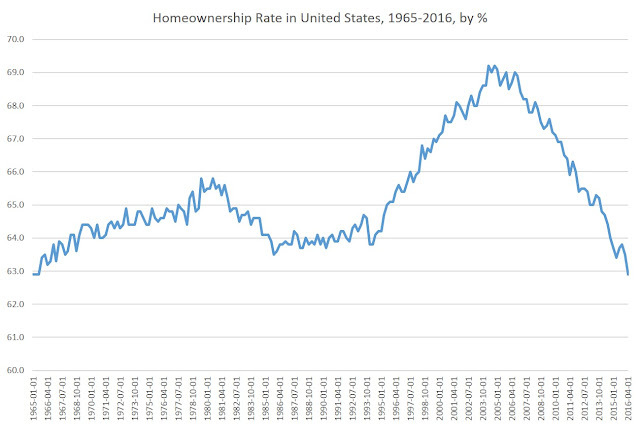 One should use caution in using homeownership as a proxy measure of economic prosperity, although in the past the homeownership rate has often tracked with general economic conditions, as was the case in the 1980s. Whatever the cause, the latest data does suggest that both the national and local economies are moving more toward a rental-housing focused real estate economy, it this does not look like it will reverse itself unless real incomes begin to gain more steam or more home construction begins to ramp up.